On ride day, though, the adrenalin was in evidence and everyone was pretty keen as we lined up for the start of the 100 and 60 km event. The ride was wonderful. 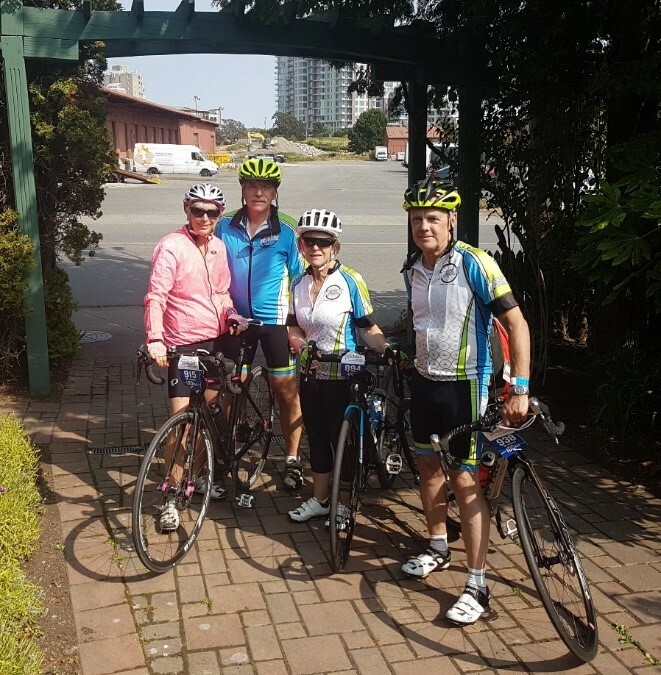 We had a visitor from Scotland riding with us and she was overjoyed with the scenery and community spirit evident throughout the day. 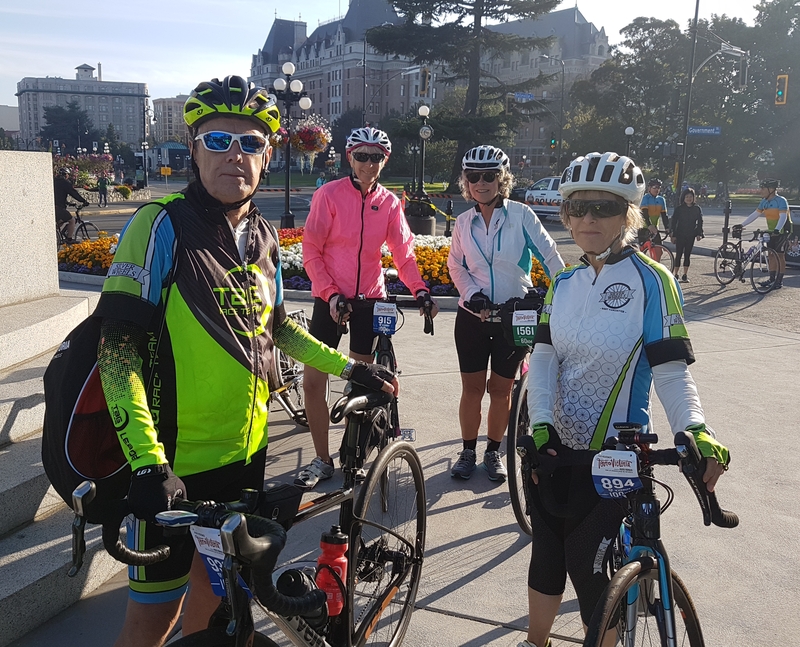 We had several riders who had never participated in a large group event before and they were all impressed with the organization and atmosphere on the day. 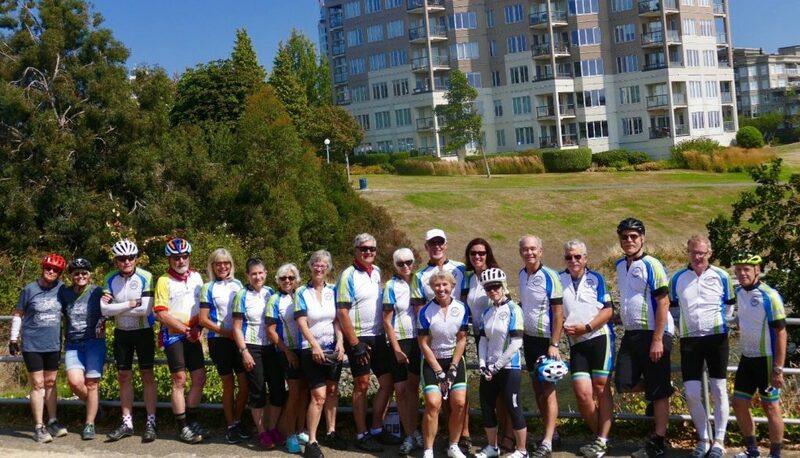 Thankfully, the weather cooperated with the calmest conditions we can recall from the TdV events we have ridden, perfect temperature and, with nearly 100 riders from Silver Wheels and TaG, seeing riders we recognized everywhere during the day. 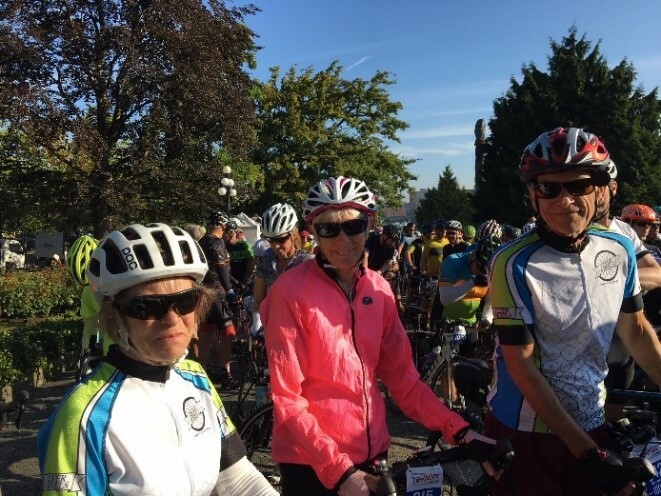 Kim and I rode the entire route with Di and Ed Bryant – Di and Ed were our friends with whom we toured England in May. The Munn Road climb was a challenge as we expected, unfortunately we came upon the vehicle-cyclist crash just after it happened. Getting passed by the 160 km peleton “freight train” was eventful – between the very fast, double line group and our riders we took up the entire road. Thankfully no cars in evidence at that point. Silver Wheels and TaG riders did very well in the ride results – a number of them finishing in the top 3 in their age/gender. 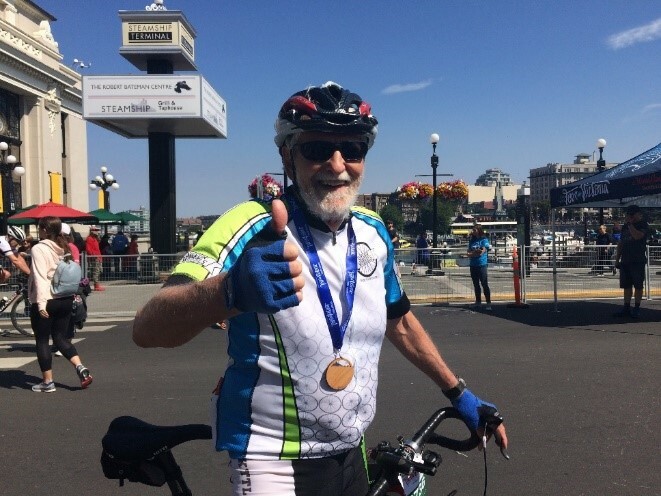 Especially good to see Mark finish well and he was very pleased to participate in the event – I hope I can do as well in the 80-99 age category when I qualify for that group! As a bonus, on Sunday morning we left our Silver Wheels kit in the laundry and put on our TaG kit for a team social ride with Ryder, Seamus and Hugo. It was a rather quick out and back on the 30 km route with a very nice coffee stop afterwards. A great way to finish off a most enjoyable weekend of cycling. So, see your next year! It was the boost I needed, a massive boost. 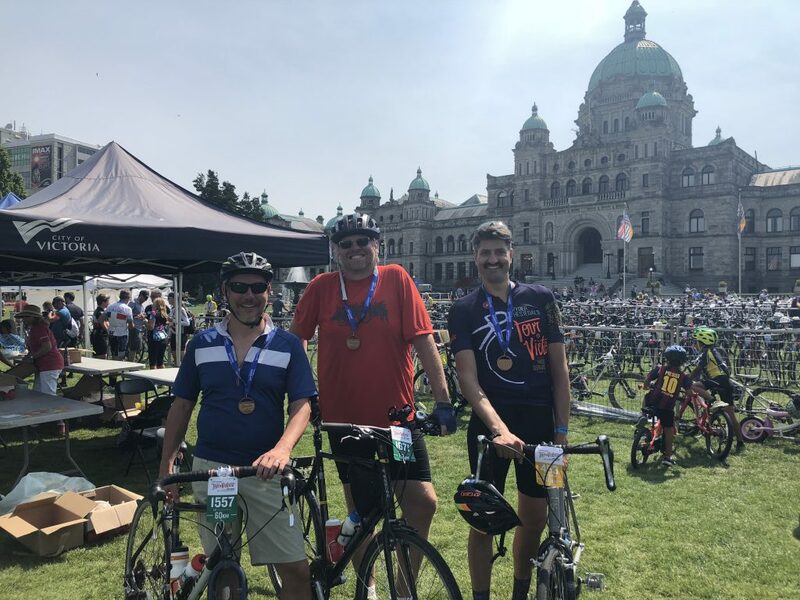 Five days later and I was still recovering physically from the Tour de Victoria’s Harbour Air 140km route. But holy pumpernickels, I now know I love big rides!!!! Of course I’m still wiped, what with the smoke in the air, and with a Saturday afternoon of pints-instead-of-naps, I had been dead to the world until today (Thursday). It was my first continuous ride over 90km and first time this year over 70km. 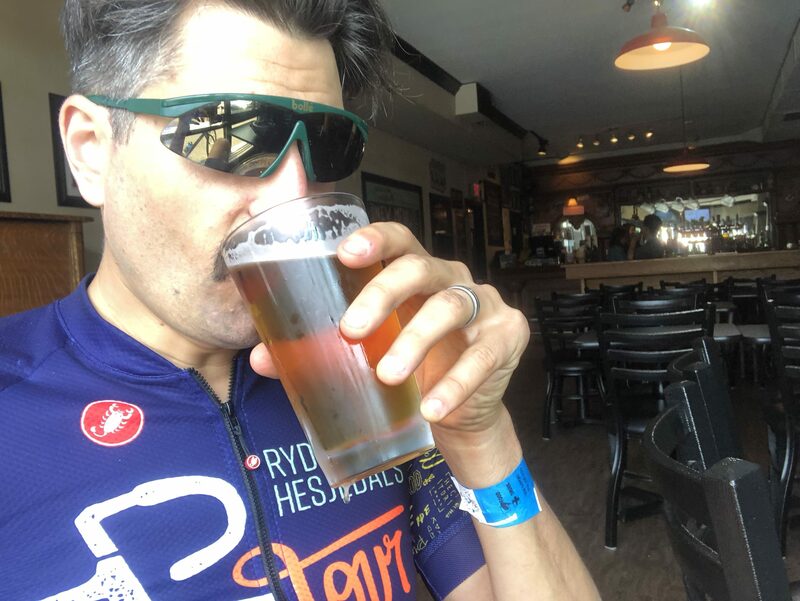 Mentally, it was far more than a ride, it was an overdue lurch forward in the life of a dad who was threateningly lame as he encroaches his 40th birthday (in a month, I’m not scared, bring it). As my wife put it, when I got back after the ride on Saturday I was in the best mood she’d seen me in for years. Still am. Bloody good ride it was. It’s all the work you put into it, the rides, after rides, and those nights not drinking from a growler. Started alone at the back of the pack amongst something like 800 or 1,000 cyclists, and I wasn’t social. I love the energy, I love being with the pack. I was present, I was brimming with excitement, ready for the unexpected, ready for cyclists to do things I’m not used to being around. And I was real quiet. I wasn’t spending a lick of energy I didn’t need to. Mental health was good. Inspiration, full check. The first 20 kilometres was adrenaline-fuelled and I didn’t really feel anything until Colwood. Wow. Lagoon Road, the Hatley Castle and ocean views, changed everything. It had all the beauty, and far more, than the two previous 90km TdV I had participated in. I’m currently an unabashed masters student at Royal Roads and it was a huge fist pump as I used the descent of Fort Rodd Hill to bridge the gap to a group along windy Lagoon Road. Just two months I ago in June I was living at Royal Roads for an intense three weeks (there is a cool KOM there on the campus’ Serpentine Road, really fun). I see now how crucial my time was there in June. Instead of making dinner, many days I jumped on my bike at 4:45 p.m. and rode out to Metchosin, or up to Munn Road, and then got back around 7 p.m. and studied for the rest of the night. Then, a profound moment. My life ticked over a new chapter when I turned off the hills of Munn/Millstream and onto Willis Point Road. It was only the halfway point, about 72 km to go, but the mental battle was won. The rolling hills of Prospect Lake were coming, didn’t matter. That Hastings ramp? Yeah, I heard people complaining about it, but the irony is that was no different than three or four of the same ramps on Millstream. Wasn’t a thing. 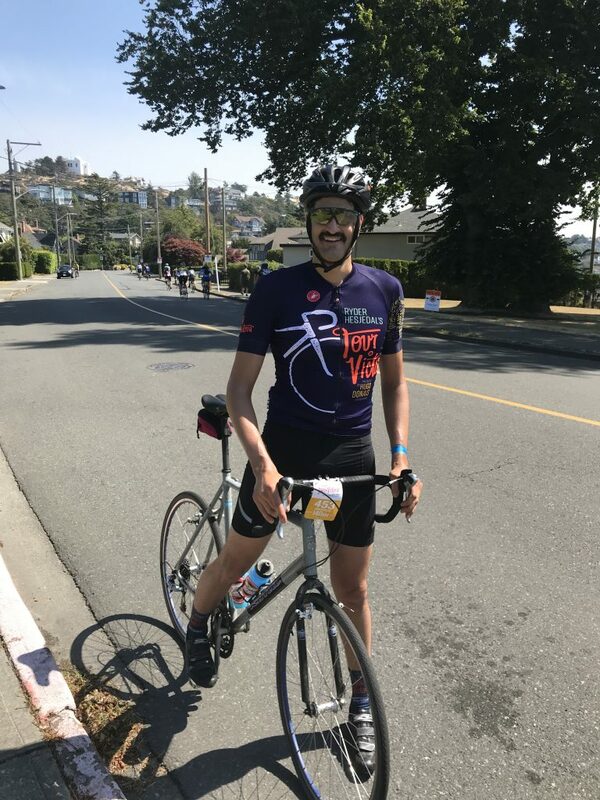 For me, the loop through West Saanich was harder than it should have been, and not coincidentally, I cracked on the same hills along Old West Saanich that I cracked on during the bike course of the Aug. 5 triathlon. After that came Prospect Lake, which I rode pretty easy as I realized that yes, indeed, I had rode the Metchosin leg of the route too fast. But the rest of the way, after crossing the Pat Bay Highway into Cordova Bay, I was able to really enjoy it while pedalling at a decent clip (for me). I skipped the Cordova Bay aid station (in all I hit about half of the aid stations) and clung to a couple (really nice riders) wearing matching Velo Vets kit. I owe them one, they pulled me through, off-and-on, all the way to Cadboro Bay before we split, I believe. Even if I had wanted to bury myself for the Happy Endings time trial section from Uplands to the finish, I couldn’t have. Instead, at Gonzalez, I stopped to say hi to my dad who was cheering on the sidewalk. He took a photo of me. That was awesome. Then, after a good rip along Dallas Road working with a guy in a Tripleshot kit, and fighting through a leg cramp, I pulled off to join a different crowd at Ogden Point. Down on the beach I got a massive welcome, and hug, from ultra marathon swimmer Susan Simmons. I couldn’t believe how great she made me feel, she always does. There she is, about to do a TV hit, sitting relaxed on a driftwood log among dozens of supporters, mentally prepared to do a 24-hour Juan de Fuca double crossing (with no wetsuit) and she made ME feel special. What a person! I got back on the bike, finished strong. Five hours and 34 minutes, about 30 minutes faster than I thought I’d be. At this point I am so grateful to my wife @dralexisblanks for running the household (and her practise) while I was basically in training camp at Royal Roads, both for the mind, and the body. She’s an amazing partner. I’m awestruck that I accomplished 1,885 metres climbed on one ride. With Mike Hassler & Joe Wiebe, the lieutenant and captain of our team The Thirsty Riders. It’s a toss-up now as to whether I go for the 140km again next year, consider the 100km to see if I can speed up my pace, or if I go for broke and bump up to the 160km. Guess we’ll just have to see what distances the Tour de Victoria offers. If you visit my street on a Saturday morning in May, you’re likely to find a four-year-old boy chasing a seven-year-old boy on their bikes screaming obscure references only a cycling fan would know. I had the same conversation with my brother when I was a kid except it was Gretzky and Lemieux, and not European bike racers. That’s not to say we’re a bike racing family. We’re not (at least not yet). But we love riding for recreation, and we love following the sport’s big races via the internet, which are mostly in Europe and finish during breakfast time here in Victoria. And if it sounds abnormal, it’s my fault. Well actually, it’s Ryder Hesjedal’s fault. He is probably… wait, Ryder is totally the reason I’m training for my fourth straight Tour de Victoria. A few years before I got into cycling, it was 2010, and I was sitting at the Victoria News sports reporting desk. 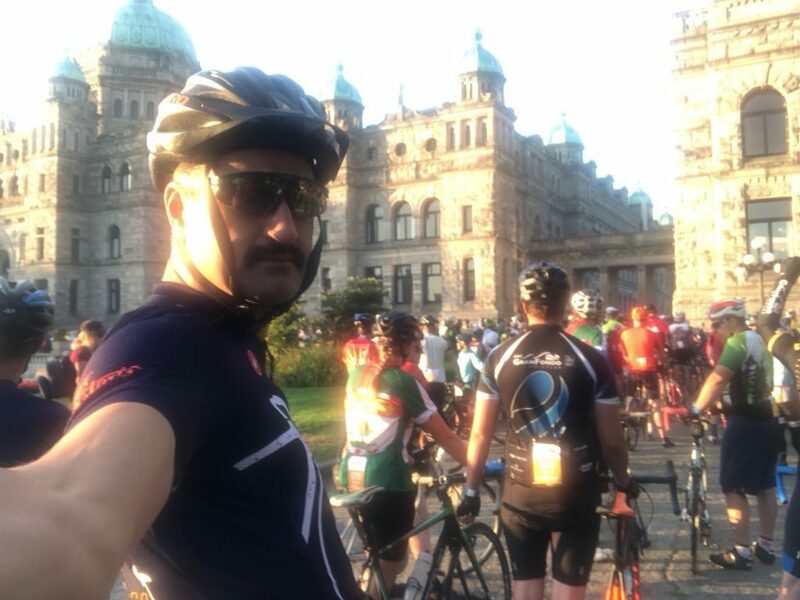 I took a call from Seamus McGrath, the director of Tour de Victoria and who I knew of as a two-time Olympic mountain biker. 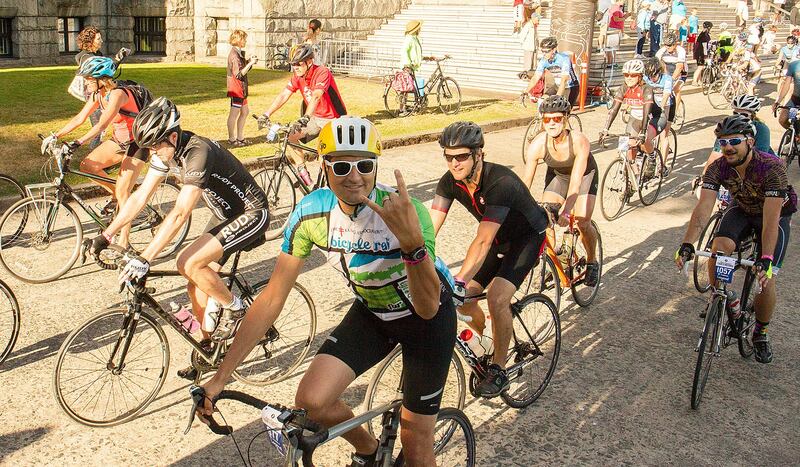 He phoned to tell me about this new mass participation cycling event he wanted to create across Greater Victoria. I remember he had to visit all 13 councils from Sidney, to Oak Bay to Sooke. That summer I started watching and reporting on Hesjedal each day.  My wife and I fell in love with the morning routine of watching Hesjedal and the peloton ride through the French countryside before heading off to work. 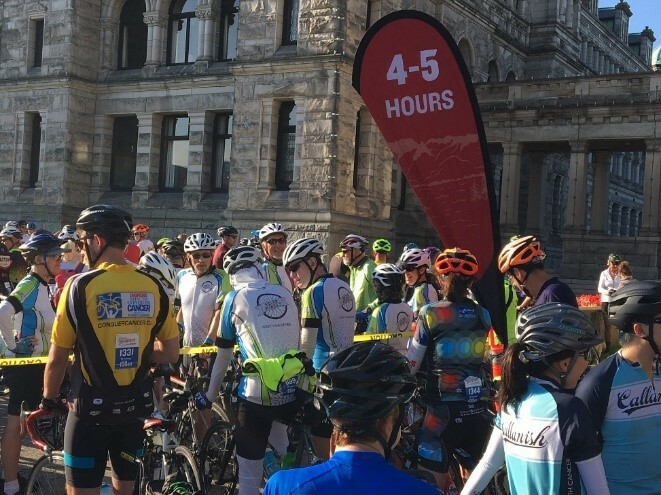 But it still took me a five years before I joined the Tour de Victoria on its fifth edition in 2015. 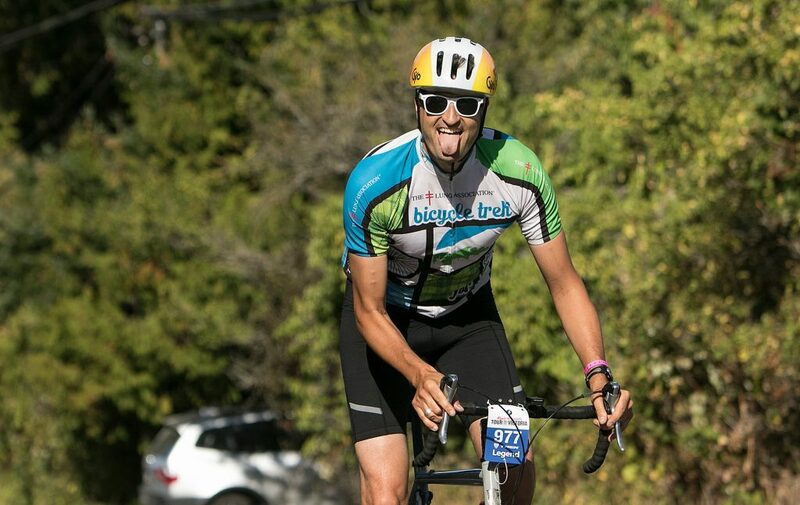 This summer I’m excited to share my journey in the build-up to the 2018 Tour de Victoria. I started in with the 45km from Sidney. I learned I really didn’t know much about cycling or how to train for it, except that I was scared enough to know I needed to get in a lot of rides. On that 2015 ride I had to stop about 10 minutes in and borrow a friend’s multitool to tighten a broken crank, and then I repeated this act the whole ride (he let me take the tool). The next year I took the bike in for a pre-ride tune up at (the wrong) local bike shop in anticipation of jumping up to the 90km ride and, once again, I had to stop and tighten the crank about five times throughout the ride. I got the bike fixed, finally, and had a much more enjoyable 90km ride in 2017. To challenge myself again this year, I am making make the jump to the Harbour Air Seaplanes 140km. I’ve never biked beyond 100km, and only hit that mark once, so I’m serious when I say this will be a big jump for me. I am a full time parent, reporter, and masters student, so finding time to bike is not easy. Finally, I’m proud to say the amount of cycling I watch is starting to be outmatched by the amount of cycling I actually do! 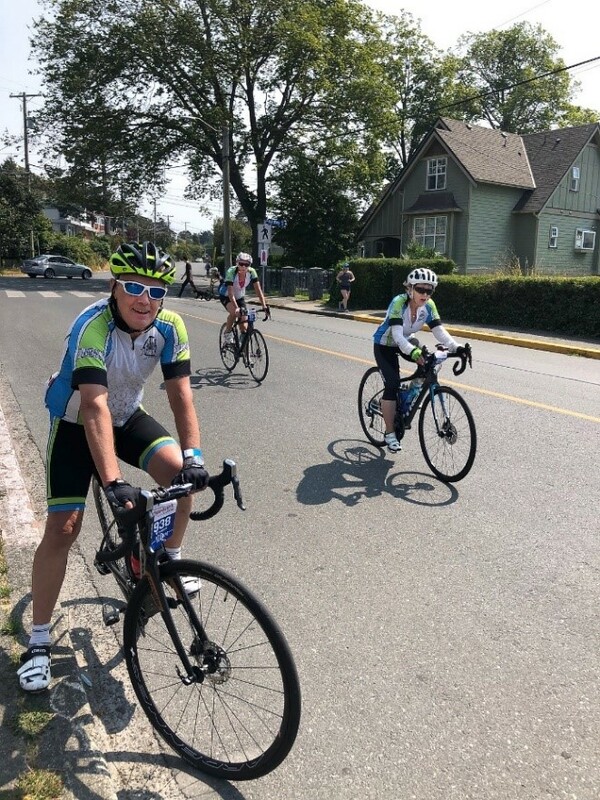 Look for my upcoming blogs about my painful but rewarding first experiences accomplishing popular local rides that are part of the Tour de Victoria, including the legendary Munn Road hill climb, riding in headwinds, and sneaking on the back of group rides.